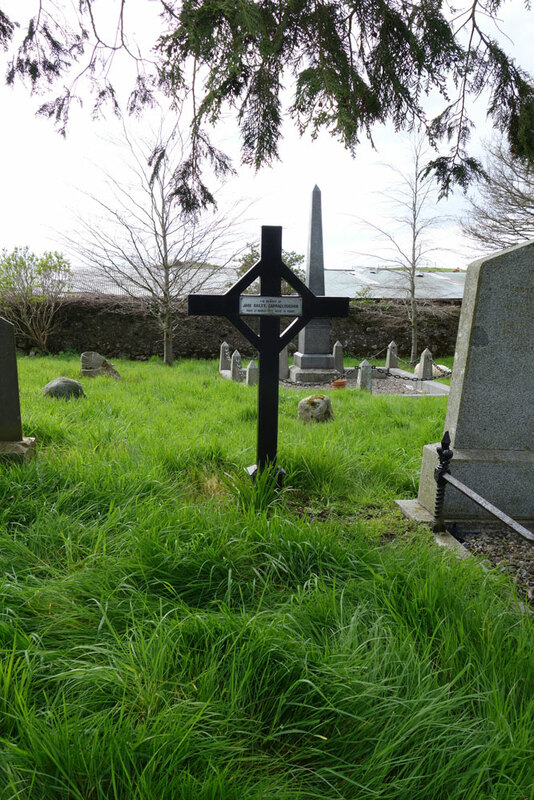 This was a graveyard in County Louth where Presbyterians from nearby were buried. The versions contributed by Mr. P. Crossle, and published in the Journal of the Association for the Preservation of Memorials of the Dead, Vol. VIII. no. 4 (1911) have been included with Noel Ross’s transcriptions when the two versions differed (probably because of further erosion of the stones that occurred between the first and last transcriptions). I did a few small copy edits whenever other research filled in the blanks. Updated 2018 July 10 Updated info on Charles JACKSON. Townland of Kane, Parish of Kane, Barony of Upper Dundalk, Co. Louth. NOTE: James EPINASSE was a son of William EPINASSE and Margaret BAILIE. NOTE: Gertrude Genna FRANKLIN, born May 17, 1888 at Coolock, Dumcourt, Dublin, daughter of Lorenzo FRANKLIN. Lorenzo was a brother-in-law of John Cornwall BAILIE. NOTE: Carraghcloghan aka Carracloghan is a townland on the southern border of Clonaleenaghan. It is near Hackballscross, south of the main road, and straddles the Co. Louth and Co. Monaghan border. Mount Matthews is within its borders. This Jane BAILIE may have been a daughter ofa daughter of William Frederick & Margaret BAILIE. 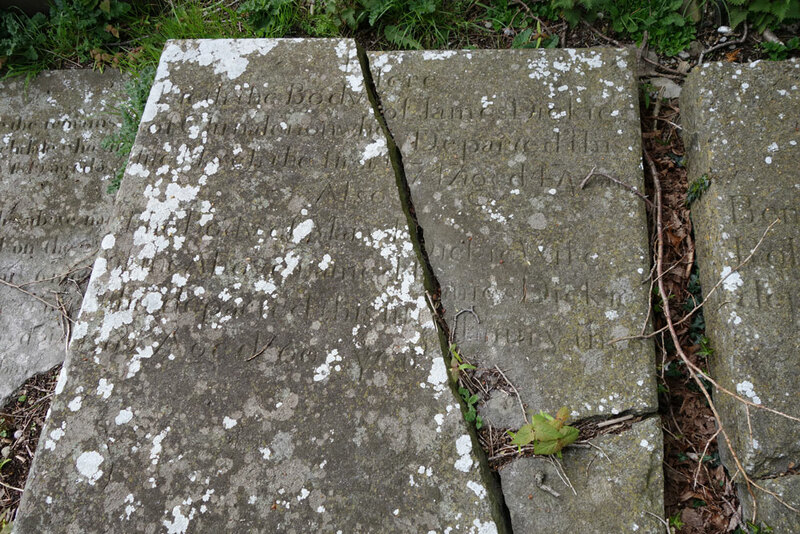 BAILIE Here lieth the body of John Bailie who departed this life May 11th 177 [sic – should be 1777]. Aged 85 years. I did not get a photo of this one. NOTE: Clonaleenan House is said to date back to 1710. Robert BAILIE born July 8, 1870. John James BAILIE. born December 23, 1872. NOTE: He was a son of John BAILIE & Dorothy SMITH. I do not know her father’s name. This was likely not visible when I visited in 2015. NOTE: I do not know Margaret’s father’s name. NOTE: I do not know Dora’s father’s name. 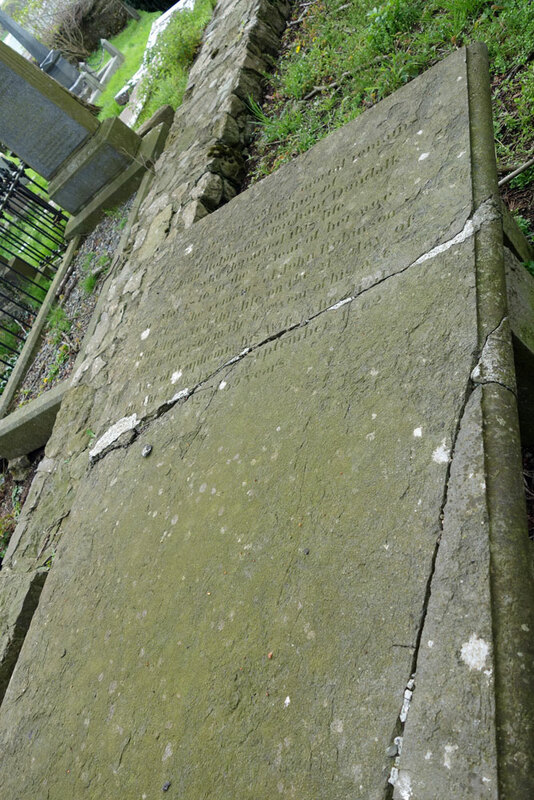 BRADFORD Here lieth the body of John Bradford, Cavananore who departed this life April the 11th 1789 aged 84 years. 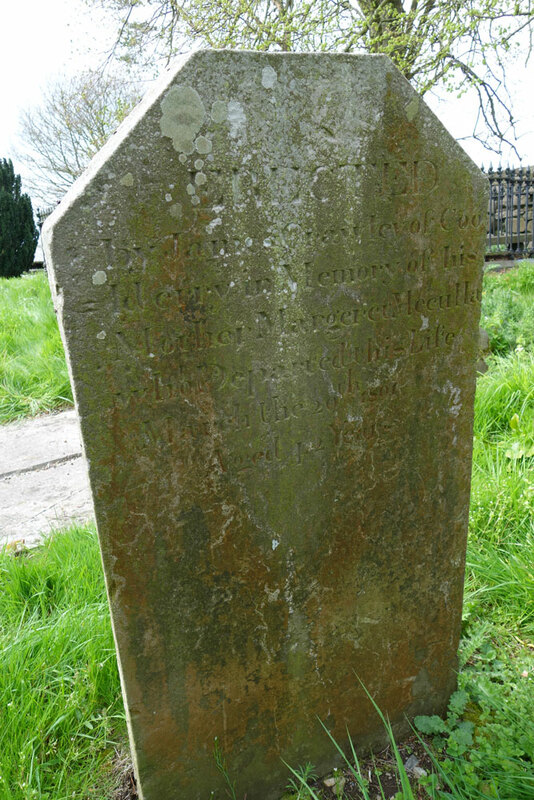 Also his wife Barbara Bradford who departed this life May 14th 1795 Aged 74 years. In grateful remembrance this tomb was erected by their son Samuel Bradford who departed this life on the 27th day of Feby 1815 aged 78 years and to the memory of his wife Margaret Bradford who departed this life on the 9th day of October 1846 aged 72 years. NOTE: This did not seem to be here in 2015 – or else I missed it. It may have been illegible. BRADFORD In Memory of John Wallace, third son of Thomas Bradford, of Carnbeg, who died on the 2nd day of January 1867 aged 15 years, also in memory of Frances youngest daughter of the above named Thomas Bradford who died on the 5th day of May 1870 aged 16 years. Daughter Charlotte who died on the 22nd day of September 1882 aged 34 years. NOTE: One of two Bradford stones in a railed enclosure. BRADFORD In memory of Thomas Bradford of Carnbeg, who died 8th Jan 1872 aged 75 years. 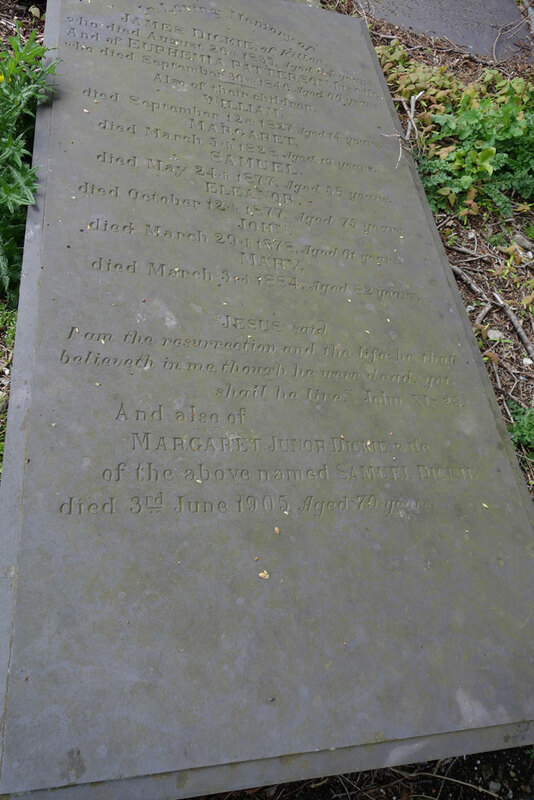 And of Margaret his wife who died 4th July 1885 aged 74 years also their son Thomas who died 23rd Sepr 1899 aged 55 years. CAMPBELL Erected by Wm Campbell of the Dundalk Distillery in memory of his wife Mary who departed this life 18th April 1852 Aged 73 years. 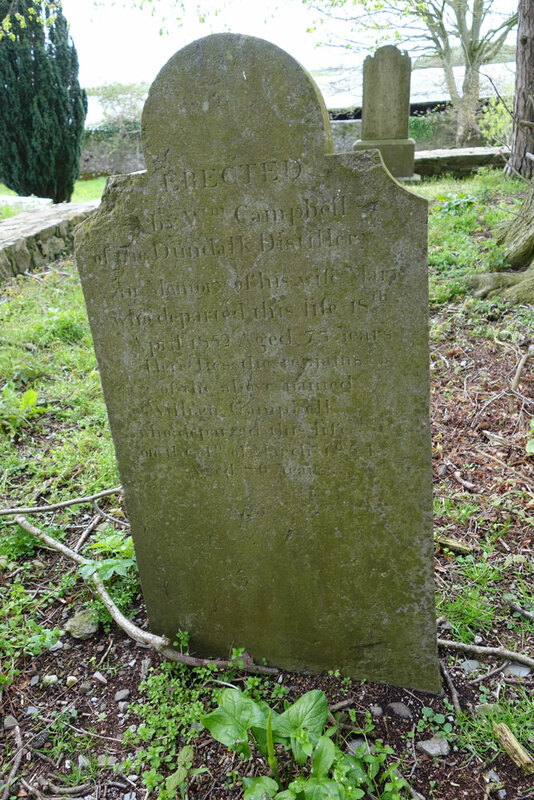 Here lie the remains of the above named William Campbell who departed this life on the 4th of March 1854 Aged 80 years. CLARKE Beneath this stone lie the remains of Elizabeth Clarke of Tullinavall who departed this life August 25. 1832 aged 69 years. 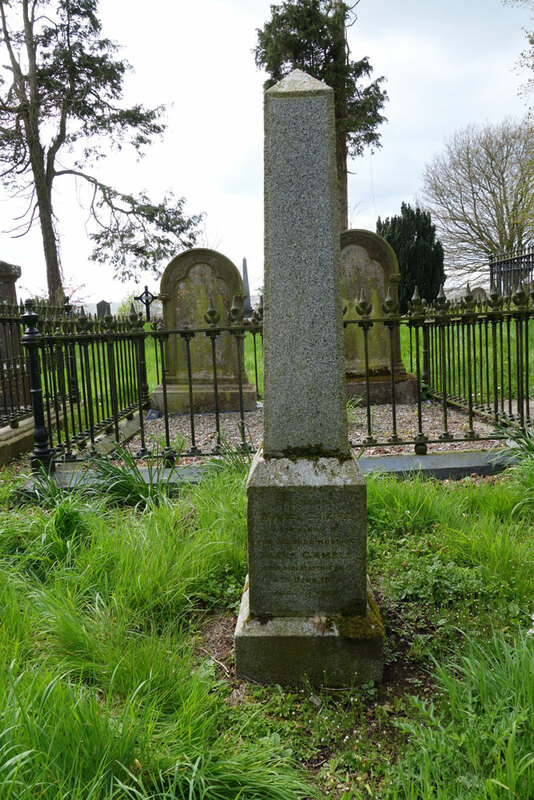 Also her husband Alexander Clarke late of said place who died May 11th 183- . . . aged 72 years. NOTE: An Alexander CLARKE leased 8 acres at Tullinaval in 1827. A William Clarke was also there in 1828, but thereafter, no Clarkes at Tullinaval. NOTE: I did not see this in 2015. According to the map, it should have been beside FRANKLIN inside the walls of the old church. It may be that it was illegible. COULTER In loving memory of Andrew Coulter Silverbridge who died 16th June 1924 Aged 69 years And his wife Elizabeth who died 9th August 1923 Aged 64 years. Erected by their children. COULTER Here lieth the body of Nathaniel Coulter who departed this life the 6th of December 17(8). aged (5) years. NOTE: I did not see this in 2015. COULTER Sacred to the Memory of Ralph Coulter Barronstown also his son William who died 14th April 1913 Erected by the above William. 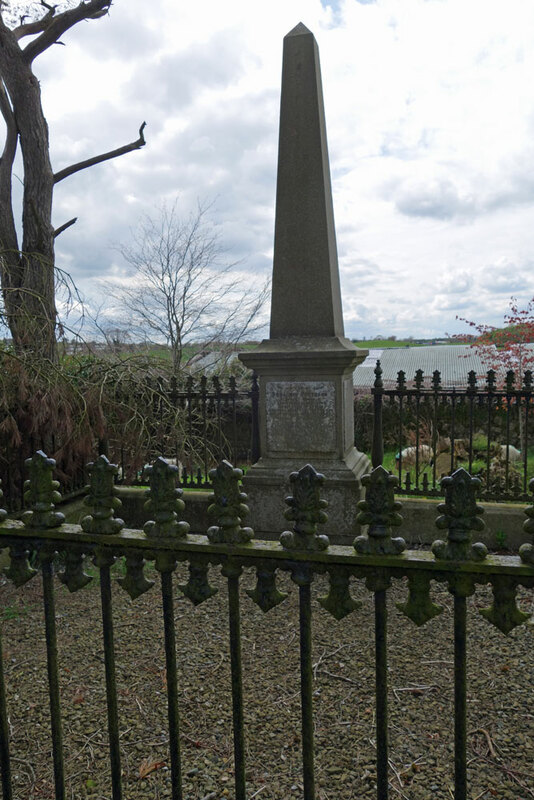 NOTE: Ralph Coulter 1785-1850 of Carrickistuck. Widow Anne Tracey (1800-1864). DICKIE In loving memory of Alexander Alfred Dickie, K.C. 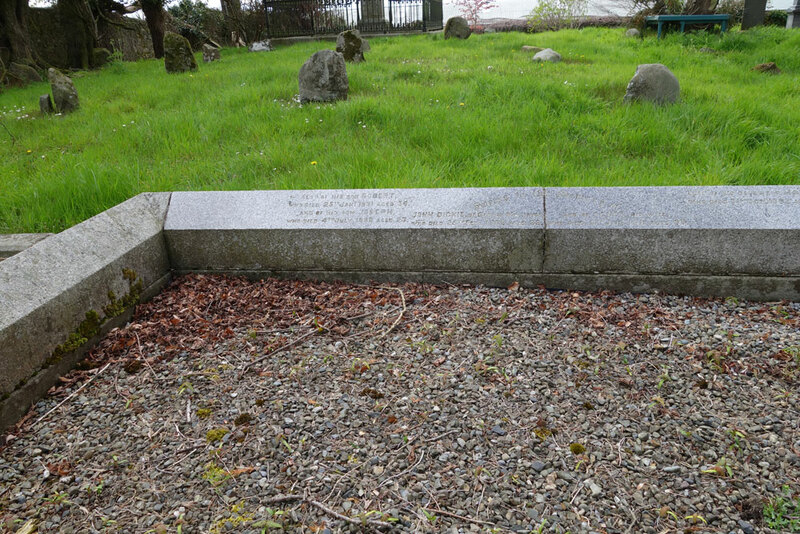 Bencher of King’s Inn of Beech Hurst, Bray, Co. Wicklow third son of Alexander Dickie of Roachdale who died 2nd June 1933 aged 65 years. And of his sister Sara Wallace Dickie eldest daughter of Alexander Dickie of Roachdale who died 20th February 1946. DICKIE Erected by John J. Dickie of Clanaleenan . . . Charles . . . so. of Lisnaboe, County of Meath . . . the 18th day of Oct 1815 aged . . . years. And is here interred at his own request. NOTE: Charles JACKSON ( 1738-1813) was most likely a brother of the Thomas JACKSON who Anne GORDON, and therefore a member of the Lisnaboe JACKSONs. Woodbine was was just across the road from Derryfalone House (home of John Thomas DICKIE at the time of Griffiths Valuation) at Hackballs Cross close to Clonaleenaghan. All were in the Parish of Barronstown. They were related to the JACKSONs of Ballybay, Co. Monaghan, and also (supposedly) to Sir Thomas JACKSON (1841-1915). I suspect Crunaleenan was Clonaleenan. DICKIE In loving memory of Elizabeth, Wife of John T. Dickie, of Clonaleenan, who died 4th April 1819, aged 25 years. Also of the following children of the above John T Dickie, and Jane his wife, daughter of Wallace of Cloghog. 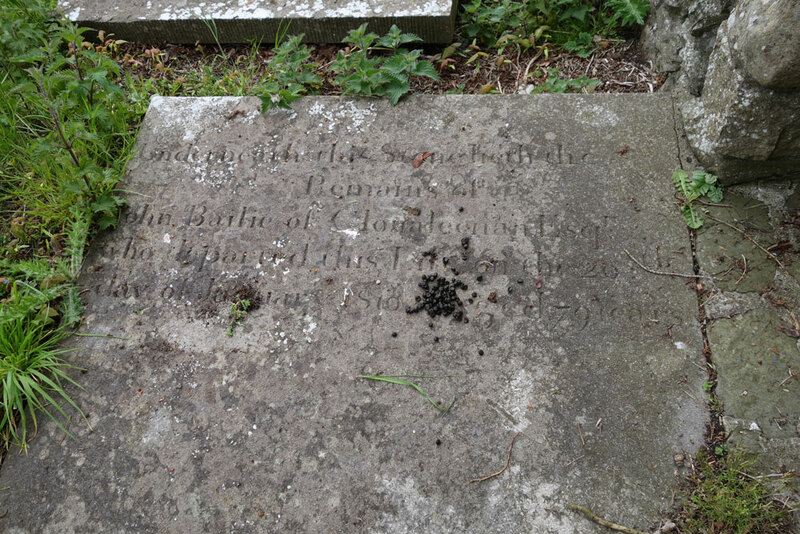 James, who died 3rd August 1846 aged 10 years. John, late of H M Customs, London, who died 9th Septr 1858 aged 30 years. Euphemia, who died 31st Decr 1876 aged 89 years. 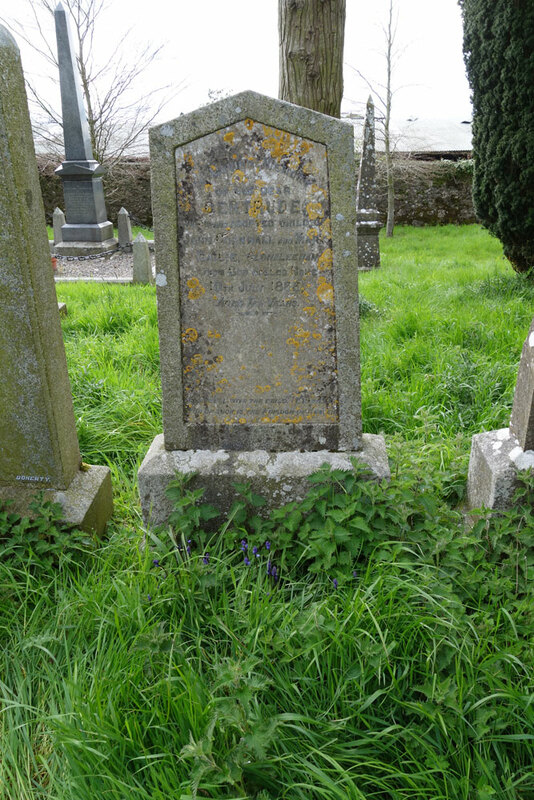 And the above Jane his wife who died 23rd May 1884 aged 78 years. Also their eldest daughter Jane who died 24th Octr 1890 aged 66 years. Also their daughter Anna who died 25th August 1922 aged 78 years. And of their daughter Eleanor who died 17th February 1930 ages 88 years. And of their daughter Elizabeth who died 8th April 1930 aged 91 years. 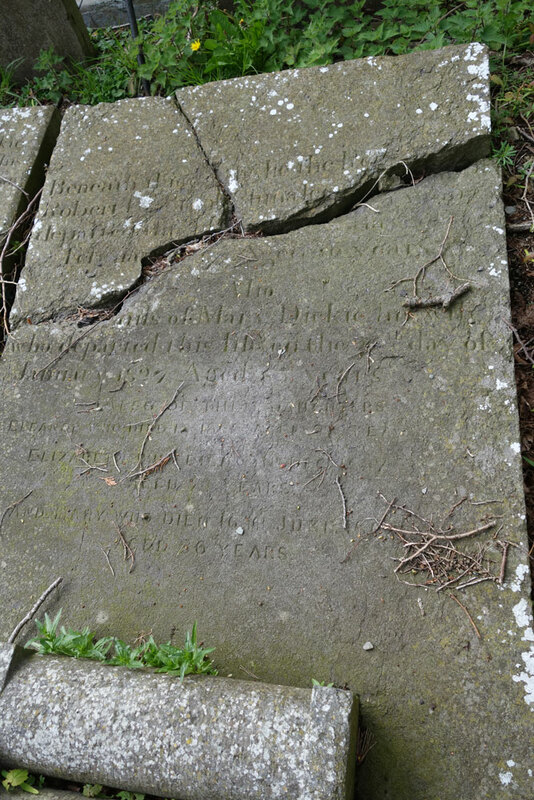 DICKIE Here lieth the body of James Dickie of Clunalenon who departed this life March the first 1747 Aged 47 years. 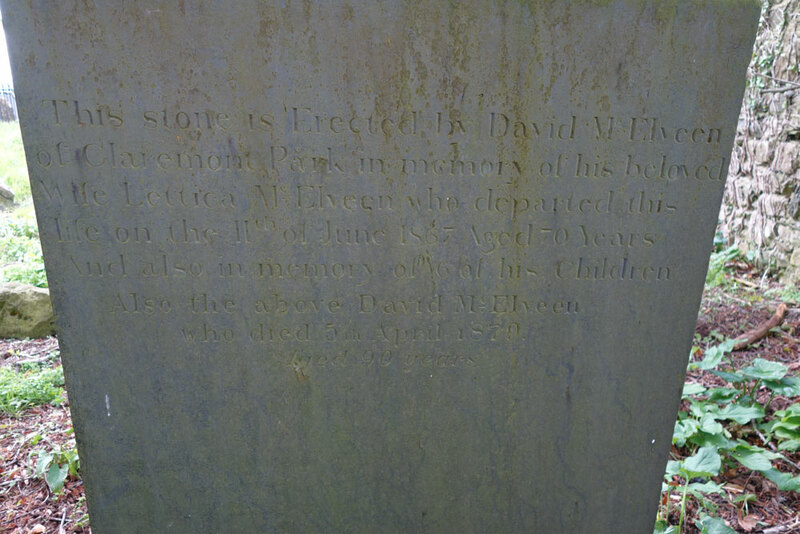 Also the Body of Mary Dickie wife of the above named James Dickie who departed this life the 5. 1762 Aged 60 years. NOTE: This is the earliest surviving marker. DICKIE Sacred to the memory of John Dickie, of Casino Malahide who died 25th Feby. 1902 aged 82. And of Agnes, his wife, who died 11th Jany. 1911 aged 88 . Also his son Robert, who died 25th Jany. 1891 aged 36 . 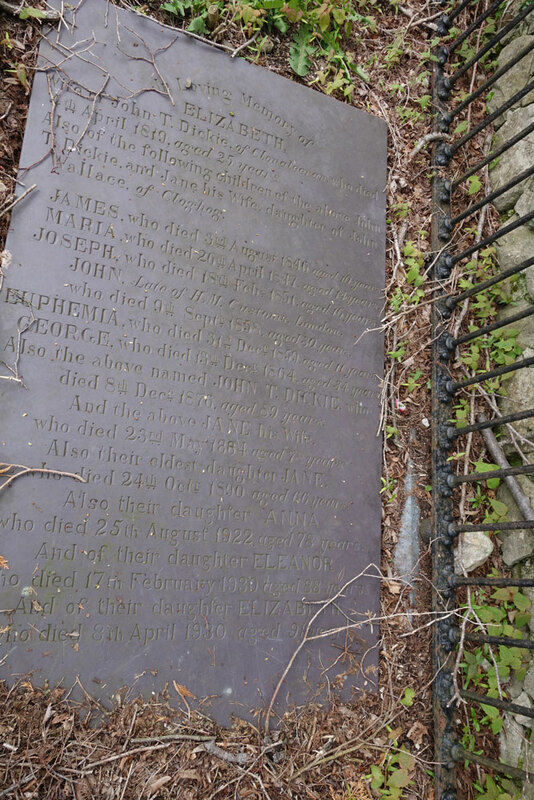 And of his son Joseph, who died 4th July 1888 aged 23. And of his daughter Margaret, who died 31st Oct 1892 aged 29. DICKIE - January 25, of pneumonia, at his residence, Seabank,Castlebellingham, Robert Dickie, Solicitor, Dundalk, eldest son of John Dickie, Casino, Malahide, aged 36 years. Funeral will leave his late residence, this (Wednesday) morning, at eleven o'clock, passing through Dundalk about 12-30 for interment in family burial-ground, Kane. NOTE: There were a number of names on this stone surround - not all easily read, and some duplicated on separate stones. 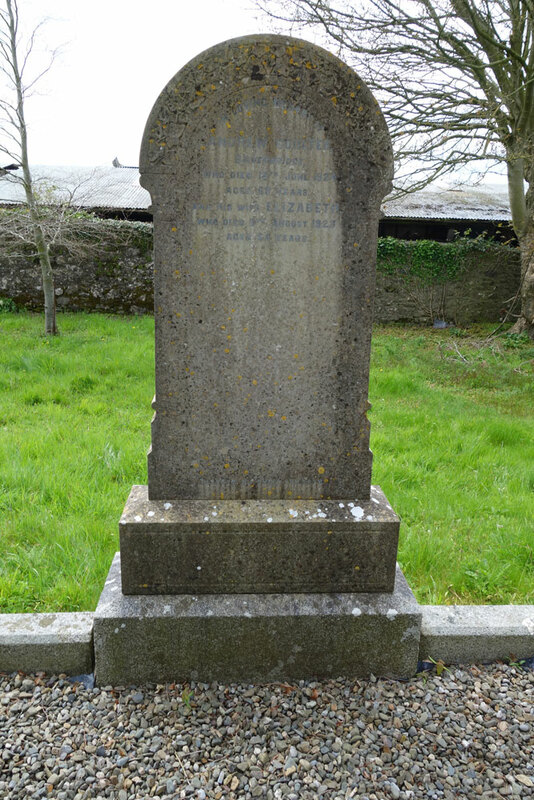 DICKIE Erected by his loving wife in the memory of her husband Joseph Dickie Solicitor late of Fairhill Dundalk who departed this life, on the 1st day of October 1877, his 56th Birthday. 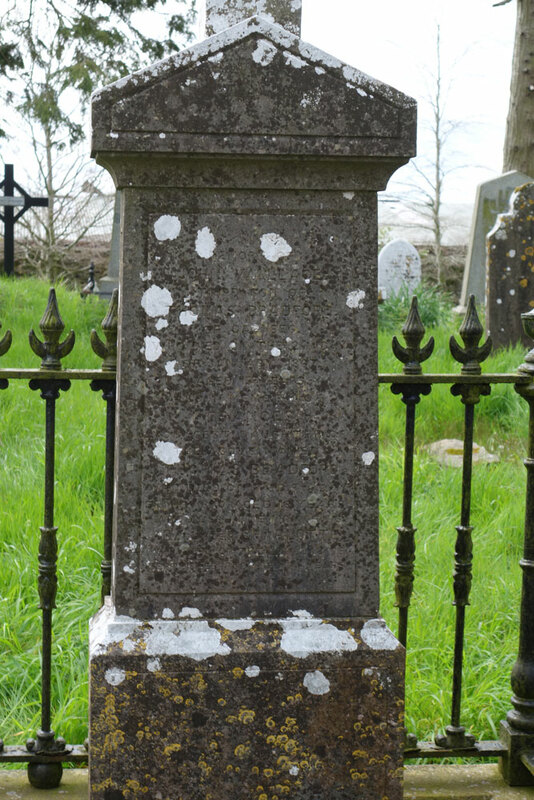 Kate the beloved wife of Joseph Dickie here commemorated departed this life at Fairhill on the 30th day of January 1916 in her 88th year. In the midst of life we are in death, watch therefore for ye know neither the day nor the hour wherin the son of man cometh. MATH XXV. 13. NOTE: The inscription is on the large stone on the right. The stone on the left is Robert Dickie. NOTE: Son of Alexander DICKIE and Anna Maria McCULLAGH. DICKIE Beneath this stone lie the remains of Robert Dickie of Roachdale who died on the 18th day of February 1810 aged 58 years. 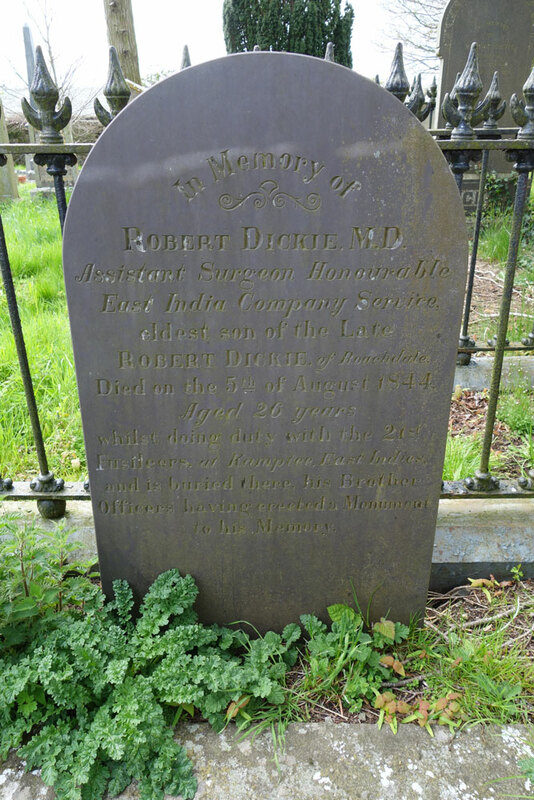 Also Jane Dickie daughter of the above named Robert Dickie who died on the 2nd day of November 1850 aged 5 years, 6 months . William died 27th of September . . . Jane died .th of December 186 aged 21 years. Mary Ann Dickie widow of the above named Robert Dickie who died on . . . aged . . . . Mary Ann Dickie who died . . . 1884 aged 61 years. 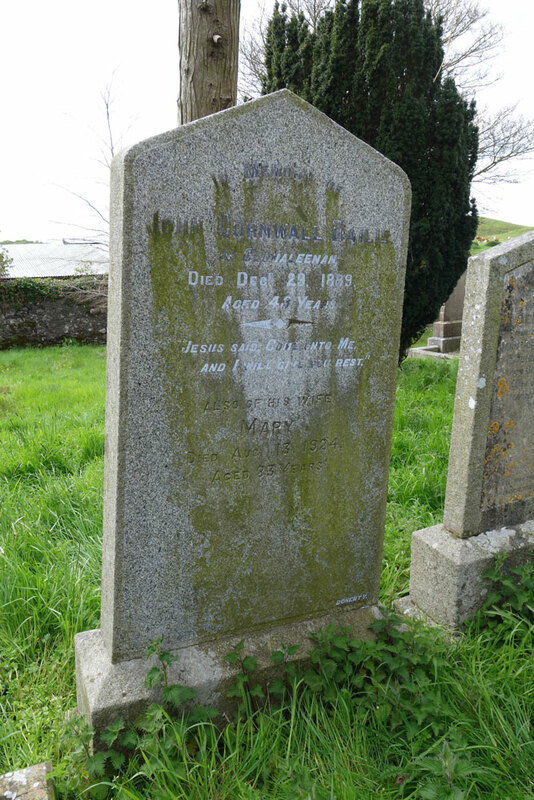 Margaret daughter of the above Robert Dickie died on October 28th 1926 in her 91st year. NOTE: The engraver made an error. 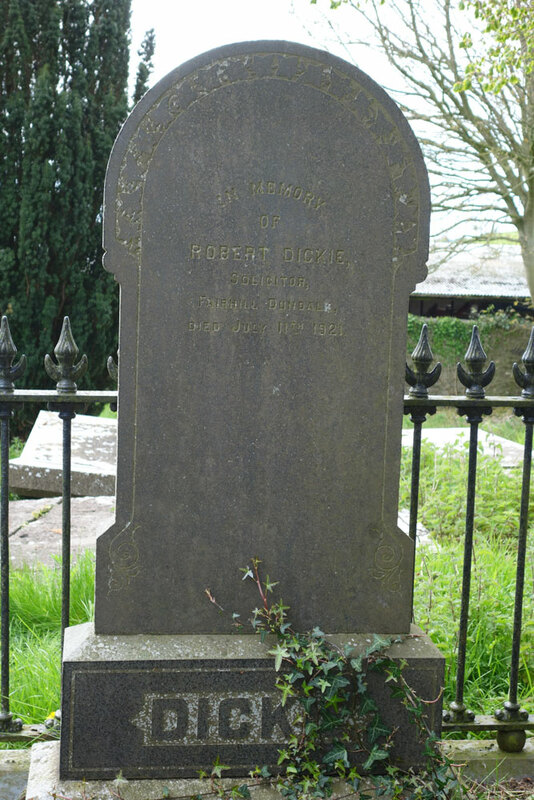 Robert died in 1840, not 1810. The Belfast News-Letter (Belfast, Ireland), Friday, March 3, 1840 On the 18th ult. suddenly, Robert Dickey, Esq. of Roachdale, near Dundalk, in the 58th year of his age. The death of the 2nd Jane was in 1856 as confirmed by a news account, so I inserted the number. The Belfast News-Letter (Belfast, Ireland), Wednesday, December 10,1856: December 5, of hemorrhage of the lungs, in the 22nd year of her age, Jane, third daughter of the late Robert Dickie, Esq., of Roachdale, in the County of Louth. 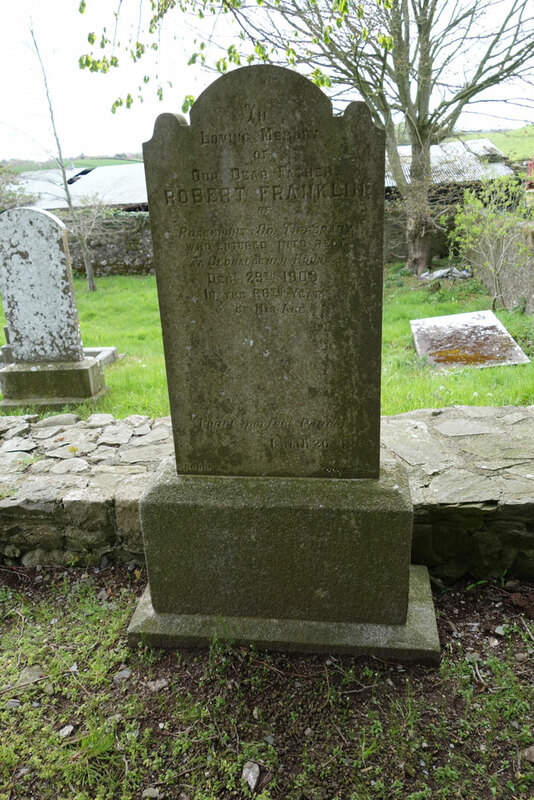 FRANKLIN In loving memory of our dear Father ROBERT FRANKLIN Rosemount Co. Tipperary who entered into rest at Clonaleenan House DecR 29th 1903 In the 96th year of his age. Peace Perfect Peace, Isaiah 6 26.3. NOTE: Father-in-law of John Cornwall BAILIE. GAMBLE Erected by MargT Gamble in memory of her beloved husband AlexR Gamble who departed this life 6TH DecR 1876 aged 75 years. 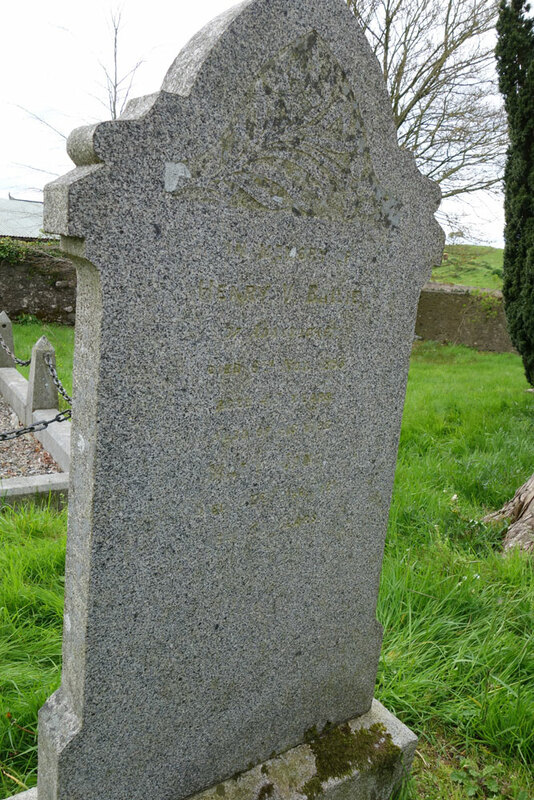 NOTES: Margaret GAMBLE née DUFF married Alexander GAMBLE on July 28th, 1851 at Inniskeen, Co. Monaghan. According to her marriage record, her father was Alexander DUFF. 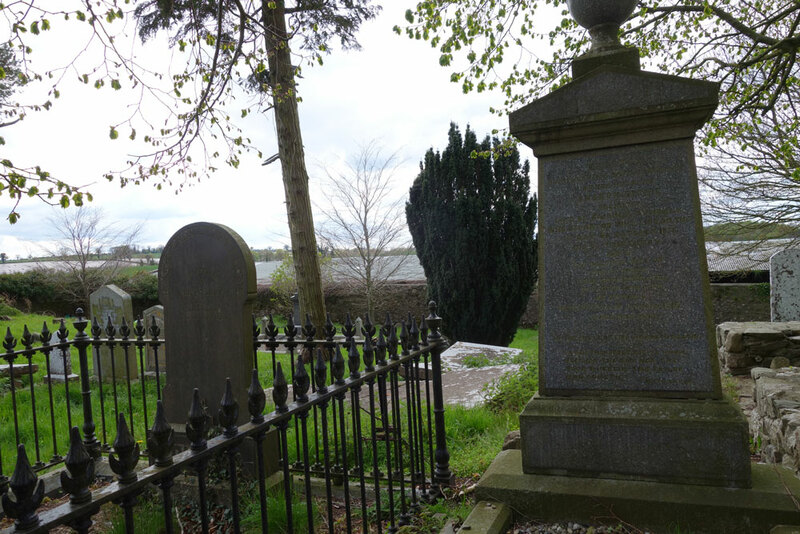 According to her will, her brother John DUFF of Aghaglass Co. Monaghan Farmer was one of her executors, as was Samuel BRADFORD of Carnbeg. 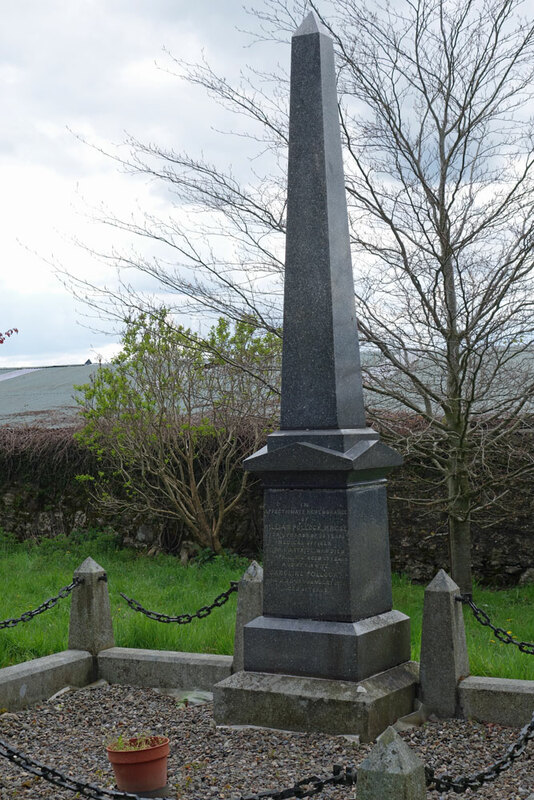 She died at Mounthill, Parish of Creggan, Co. Armagh on May 14th, 1889. Her effects were £1,936 2s. 1d., and she also had a farm to bequeath (where it was, I do not know). One of her bequests was to her niece: Anna Sophia SCOTT who was yet to attain the age of 21 at the time that the will was drafted (May 9, 1889). The bequest would be revoked if she married a Roman Catholic or anyone not approved of by the executors. HILL Erected by Essie Hill Ballsmill In the memory of her beloved husband William Hill who died 26th October 1852, Aged 82 years And her only son John William Hill, who died 2nd May 1875 Aged 32 years. 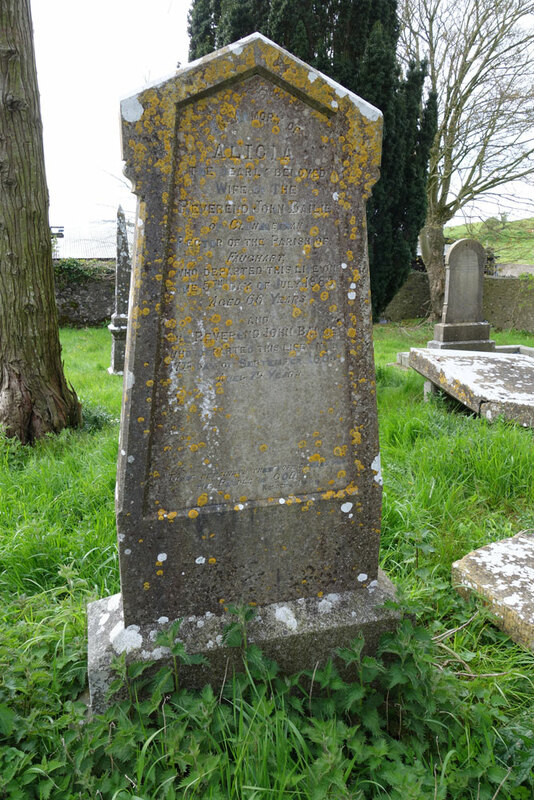 Also the above Essie Hill who died 28th Feby 1880 aged 72 years. 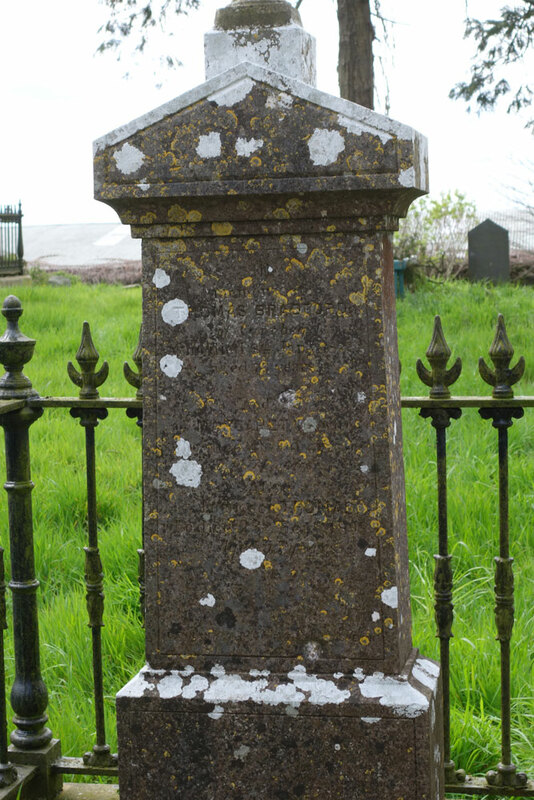 MAGEE Erected by Robert Magee of Annavakey, in Memory of his wife Marga[ret] Magee who departed this life on the 14th of January 1836 aged 33 Years. NOTE: I did not see this one in 2015. 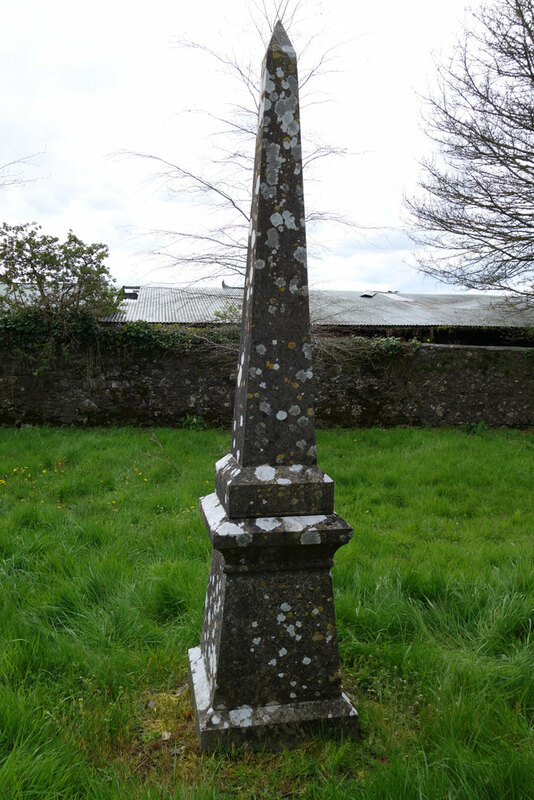 MECULLA Erected by James Crawley of Coolderry in Memory of his Mother Margaret Meculla who departed this life March the 29th 1801 Aged 42 years. NOTE: In the 1823-1837 valuation James CRAWLEY had 9 acres in Coolderry. In 1840, he was a contractor doing road repairs. McCULLA In memory of Anna Maria McCulla wife of Alexander Dickie, Roachdale, who died August 25th 1896, aged 65 years, Also of their youngest son Joseph Dickie who died February 29th 1908 aged 32 years. And of William Dickie, Roachdale, their second son who died January 27th 1919, aged 51 years. Meta youngest daughter of the above Alexander Dickie, who died January 23rd 1936. And Mary Wallace fourth daughter of the above who died December 9th 1938. NOTE: This was probably one of the stones that I could not read in 2015. McCULLAGH Erected by Mary McCullagh of Clonaleenaghan in memory of her Father James McCullagh who departed this life 26th July 1851 Aged 102 years. 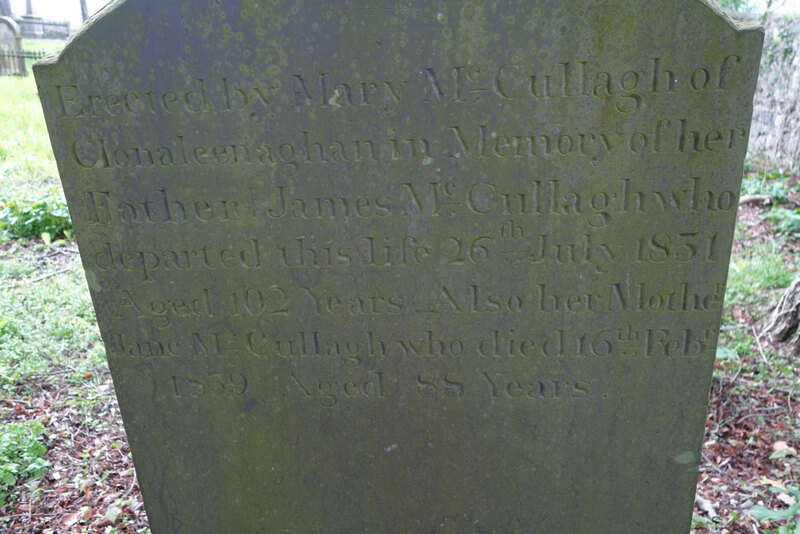 Also her mother Jane McCullagh who died 16th FebR 1859 aged 88 years. McELVEEN This stone is erected by David McElveen of Claremont Park in memory of his beloved wife Lettica McElveen who departed this life on the 11th of June 1867 Aged 70 years and also in memory of 6 of his children also the above David McElveen who died 5th April 1879 aged 90 years. 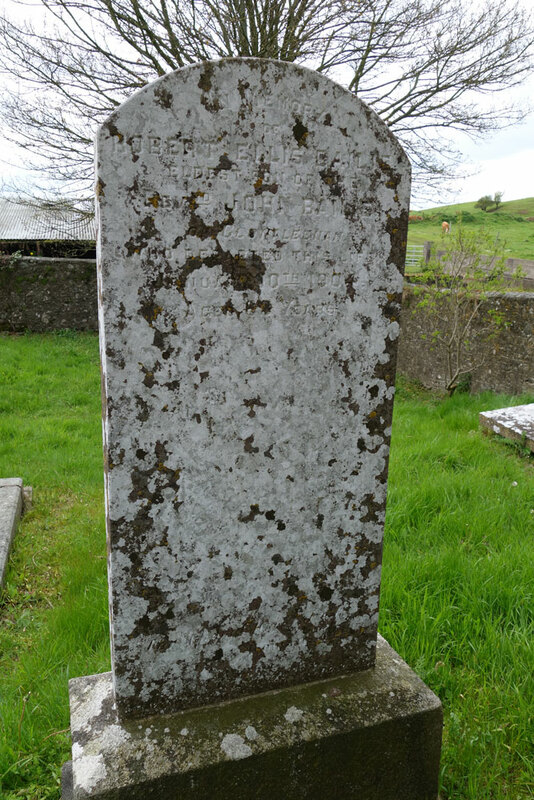 McEVOY Beneath this stone lie the remains of Jane McEvoy of Phillipstown who departed this life on the 16th day of August 1826 Aged 54 years. 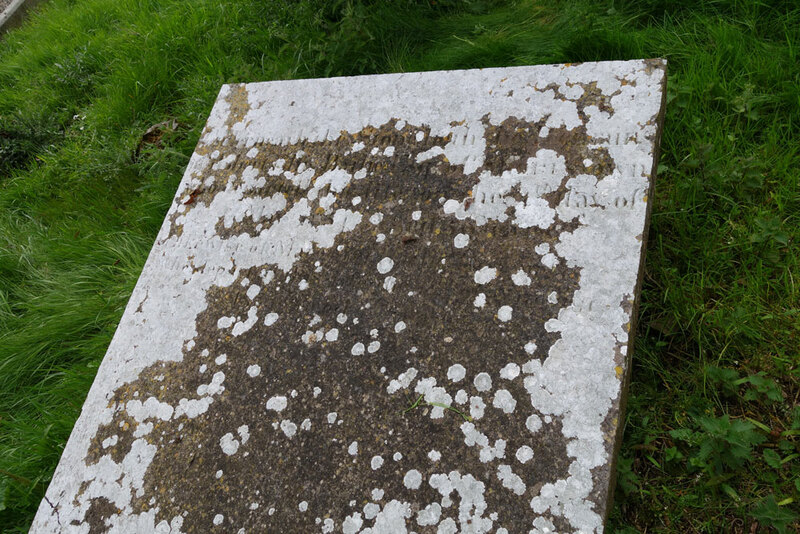 MOFFET Here lieth the body of Eleonor Moffet who departed this life .th Feb 1790 aged 64 years. OLIVER In memory of Mrs Elizabeth Oliver, who departed this life 12th July 1825, aged 40 years. 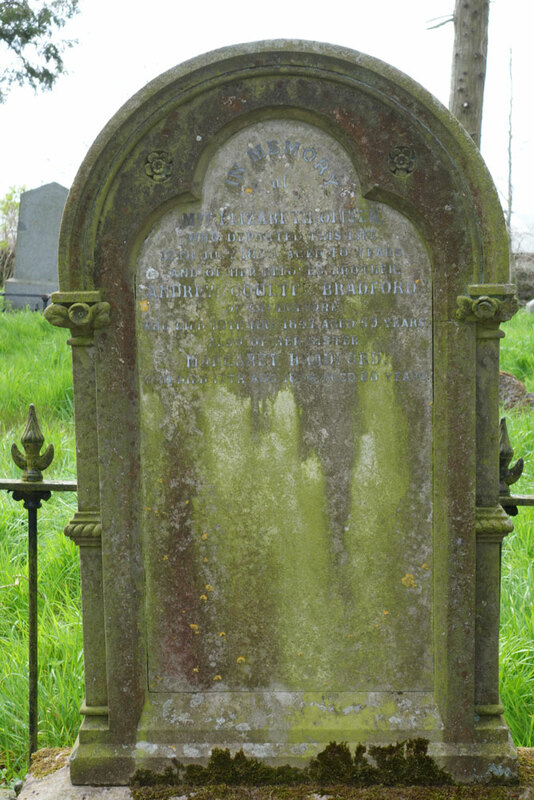 And of her beloved brother Andrew Coulter Bradford of Cavananore, who died 10th May 1847, aged 59 years, also of her sister Margaret Bradford, who died 17th Aug 1874, aged 88 years. NOTE: This is Elizabeth Oliver, née BRADFORD, grandmother of Sir Thomas JACKSON (1841-1915). OLIVER In affectionate remembrance of Mary Jane Oliver of Cavananore, who departed this life 3rd October 1875 aged 54 years. 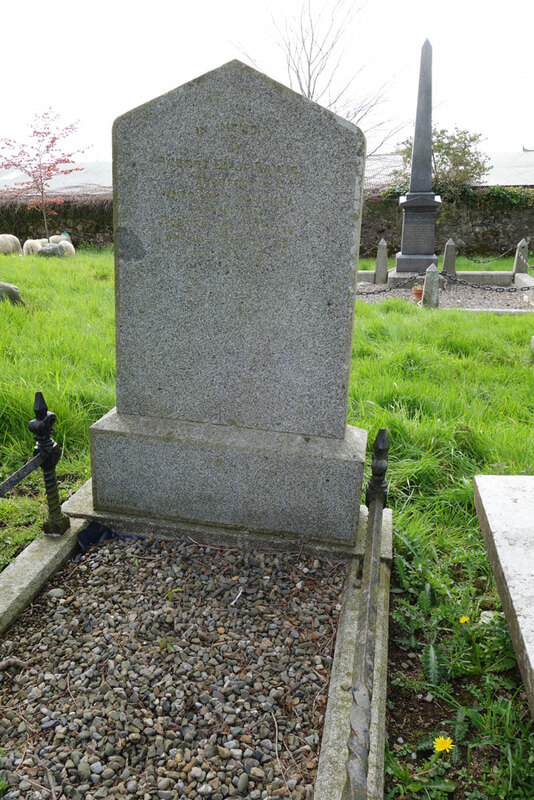 And of her niece Mary, 2nd daughter of David Jackson, Urker Crossmaglen widow of William Menary, Maghery, Armagh and of Frederick Griffin, Corrinary Castleblayney died 9th August 1921 aged 76 years. PATTESON “For ever with the Lord”. 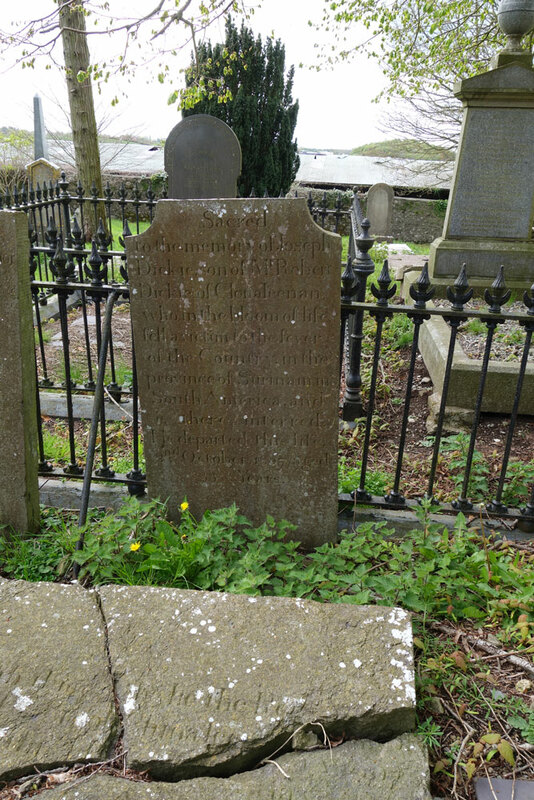 Benjamin Patteson, Merchant, Dundalk, and ruling elder in the Presbyterian church who fell asleep in Jesus on the 27th May 1865, aged 49 years. “He was not for . God took him”. 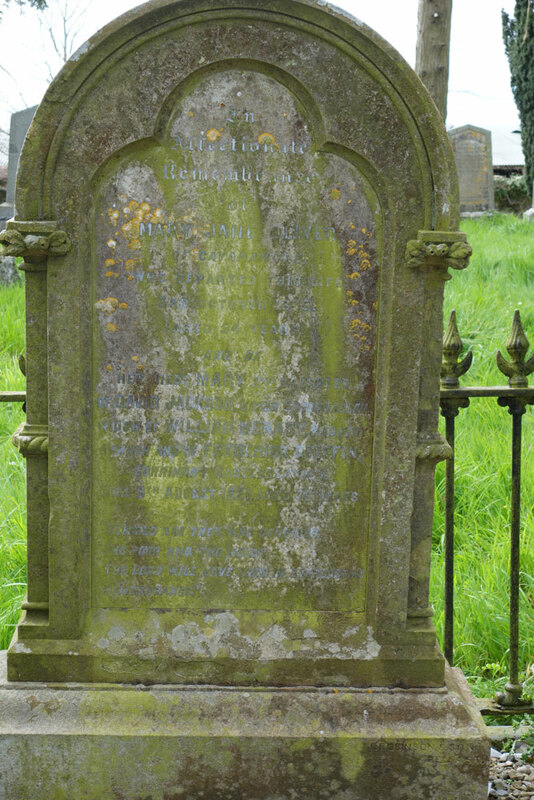 And his wife Mary daughter of William Megaw Eary House, Stewartstown, who died November 5th 1910, Aged 84 years. “Her children rise up and call her Blessed”. PATTESON In memory of Benjamin Third son of Benjamin Patteson Dundalk, who died at Leeds Jany 20th 1873 aged 19 years. Mary youngest daughter of Benjamin Patteson who died November 6th 1875 aged 17 years. 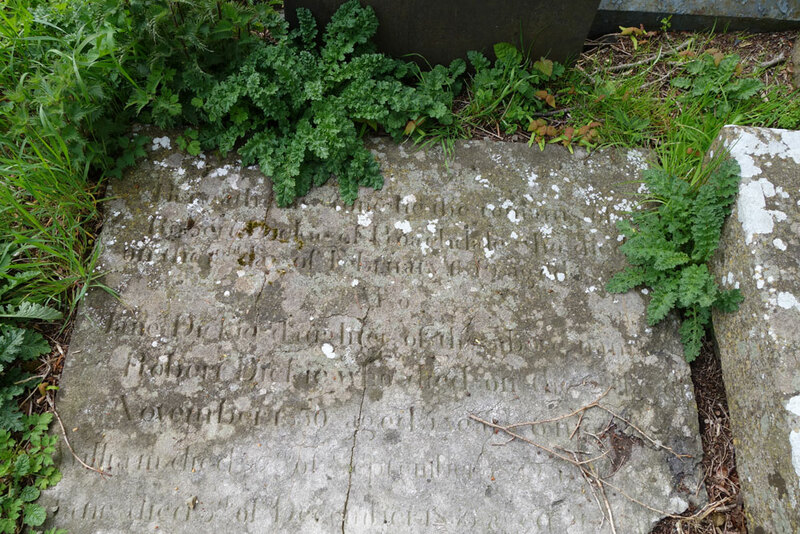 “Asleep in Jesus” Robert Glasgow Patteson, died April 11th 1900 aged 38 years. Lizzie Patteson who died Feby 27th Aged 63 years, 1913. NOTE: I did not find in 2015. PATTESON In loving memory of Matilda Patteson Megaw, Eary House Co. Tyrone, She fell asleep in Jesus on the 8th December 1871, aged 22 years. “I have loved thee with an everlasting love”. Also her sisters, Margaret George, died August 11. 1888 aged 57 years. Eliza Sarah (Magdalene) died December 20. 1893 aged 53 years. “Being dead yet speaketh”. 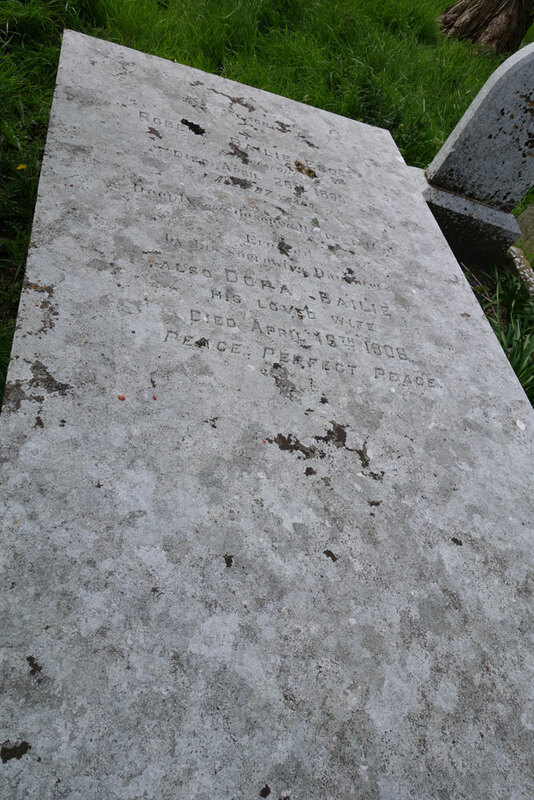 Adelaide died 25th August 1915 aged 62 years. Annie Died 6th January 1917 aged 78 years. POLLOCK In Affectionate Remembrance of William Pollock M.R.C.S.E. For upwards of 30 years Medical Officer of this district, who died 18th April 1876, aged 59 years and of his wife Caroline Pollock, who died 25th January 1876 aged 61 years. NOTE: His family had resided at Annaghvacky. Fresh pots of flowers indicate a recent visitor to this grave, perhaps a local family connection. In a November 7, 1883 letter from Eliza Jackson to her son Thomas, Eliza mentions that a Dr. Wilson and his wife Miss Pollock, were living at Cavananore, previously the family home of Olivers and Bradfords, and now leased out by Samuel Bradford. Previously, Dr. Wilson had been living with Charles Pollock. It would seem that these POLLOCKs are allr elated. ROBINSON Beneath are interred the mortal remains of El. 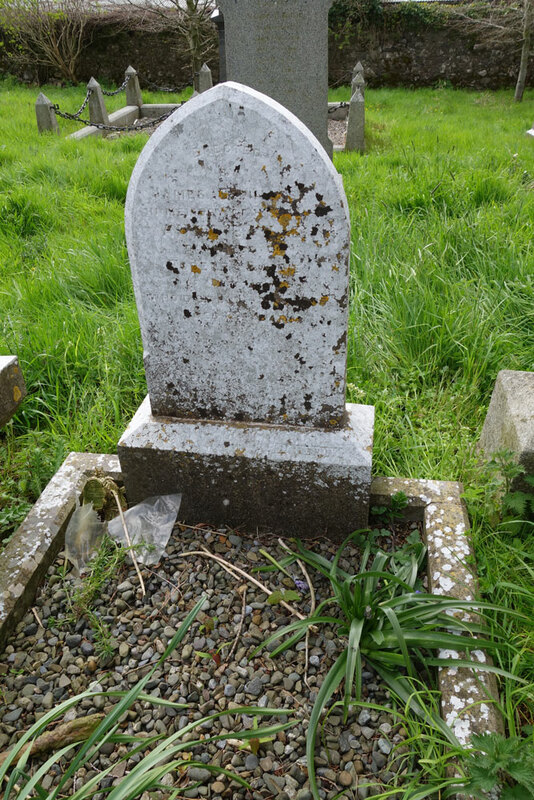 Daughter of John Robinson Merchant Dundalk who departed this life 11th May 1846 in the 4th year of her age also the remains of John Robinson who departed this life on the 21st day of November 1860 in the 63 year of his age and of Euphemia his wife who died on the 12th day of September 1862 aged 59 years. NOTE: John ROBINSON’s wife was Euphemia DICKIE. 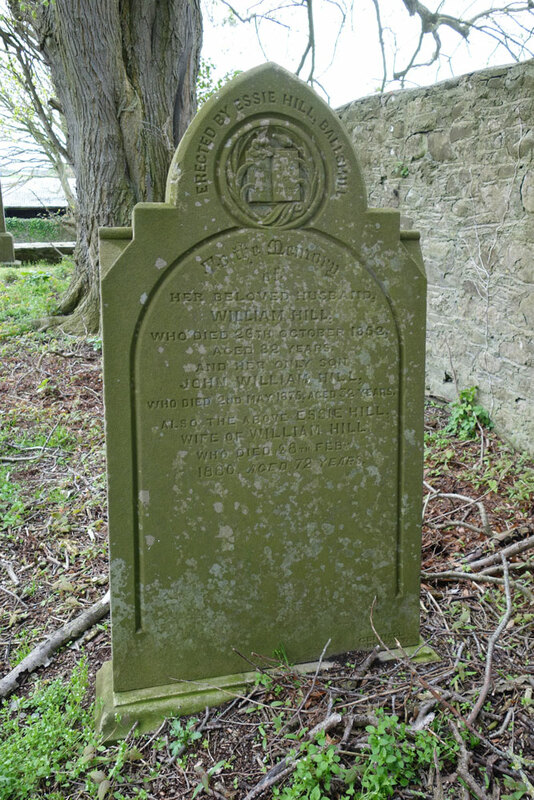 NOTE: I suspect this is Jane WALLACE who died 23 May 1884, wife of John Thomas DICKIE. I didn’t see this one in 2015.